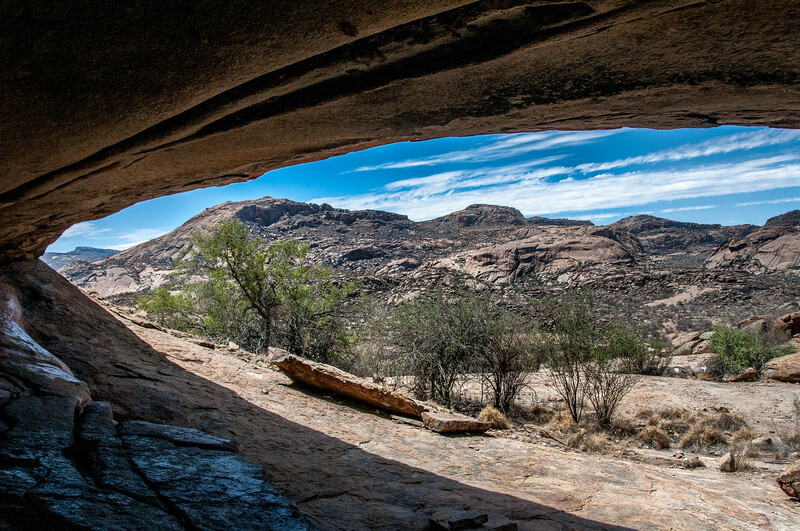 In the 1940s the Twyfelfontein land was granted on licence to a settler. At that time a few Damara people lived close to the spring in 32 huts. The land was transferred to communal use for Damara farmers in 1964 on the recommendation of the Odendaal Commission. But no farmers came forward to make use of it and it lay abandoned for 20 years. Following Namibian independence in 1990, the land became State Land under the Ministry of Lands, Resettlement and Rehabilitation. Before the 1940s, there is little evidence for the use of the area by the Damara; it is likely that as nomadic pastoralists, they used the area on a seasonal basis congregating near the spring after rains. However nomadic pastoralism had been almost completely destroyed in the preceding 100 years by the Rinderpest epidemic of 1897 and by ensuring government policies which encouraged people to leave the land. Interviews with local residents in 2004 failed to collect oral evidence for living cultural association with the rock art, although the rock art sites were seen as powerful places and the rock art the work of ‘ancestors’. The imagery of the art suggests it is part of the belief system of hunter-gathers, the San, who lived in the area until partly displaced by Damara herders about 1,000 years ago and finally displaced by European colonists within the last 150 years. No San now live in the area, although the beliefs of present-day San who live some 800km away in the north-eastern part of Namibia, give insight into the meaning of the rock paintings and engravings at Twyfelfontein. Twyfelfontein is one of the more popular destinations in Namibia, but it not necessarily easy to get to. It is approximately a 4 hour drive from Swakopmund and 6 hours from Windhoek, most of which is on a gravel road. While it is theoretically possible to visit Twyfelfontein on a day trip, it probably is best to plan an evening in the Damaraland region. The easiest way to visit would be to go with a tour company who can take care of transportation and lodging. The site itself can be visited in 1-2 hours, most of which will be walking in the hot sun. Given the dry nature of the region, the rock engravings have been preserved rather well. It is not a large site but does require some light walking on rocks. An interesting note, the local name of Twyfelfontein is /Ui-//aes. The / and // characters reflect clicking sounds in the Damara language. Damara is unique in that it has FOUR different clicking sounds, as opposed to the one click you get in languages such as Swahili. Twyfelfontein or /Ui-//aes is a cultural UNESCO World Heritage Site in Namibia. It was inscribed in 2007 and is home to over 2,000 figures of rock art carvings. According to experts, these rock carvings have been dated back to 2,000 years before 1000 AD. This archaeological site is one of the most important of its kind in Africa, not just in Namibia. Aside from the fact that it has survived for many years (and in almost intact conditions), it is also a good evidence that provides a glimpse into the way of life during the era when these carvings were created. The figures in the rock art at Twyfelfontein or /Ui-//aes depict hunter-gatherers, as well as their rituals. For this reason, it was accepted into the list of UNESCO World Heritage Sites in Namibia. It is the second UNESCO site from the country after Namib Sand Sea was inscribed in 2003. Twyfelfontein or /Ui-//aes is a site consisting of a massive collection of rock art and rock engravings in the Kunene Region of Namibia. The site is made up of a spring in a valley that is located right in the heart of two sandstone table mountain slopes. Hence, the location of the rock art receives little rainfall and has diurnal temperature. Many archaeological experts believe this was crucial in the preservation of the rock art on the UNESCO site. 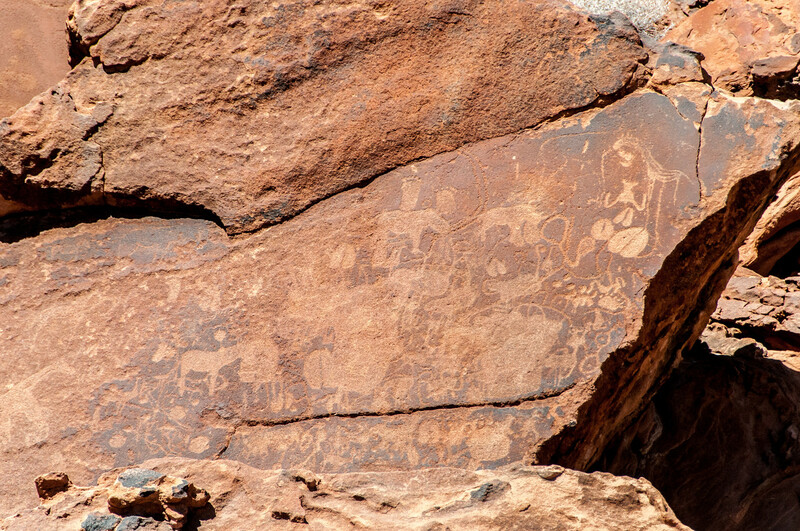 The history of inhabitation at the site of the Twyfelfontein or /Ui-//aes is believed to have been around 6,000 years. The site was initially inhabited by hunter-gatherers. After they abandoned the site, the Khoikhoi herders settled here. Both of these ethnic groups spent a long time inhabiting the area wherein they performed several rituals and turned it into their place of worship. These early settlers mostly performed shaman rituals. As part of these rituals, they also carved out figures in the rocks that are in the area. This is why experts considered the rock art of high cultural value because they not only provide a glimpse into the way of life (such as how people of the ancient times gathered food and survived) but also in their religious beliefs and ritualistic practices. The Twyfelfontein or /Ui-//aes was recognized by UNESCO when it was nominated primarily due to the sheer volume of the rock art carvings. There are over 2,500 items of rock art that were found in the area. The site is the largest collection of rock petroglyphs in the African continent. North of the Place of Ceremonies: This site consists of 65 engravings with 2 large giraffes among the most prominent figures used. Place of Ceremonies: There are over 175 engravings on this site with mostly caves consisting of rock paintings. The Seven Slabs: There are about 150-175 engravings with 2 superimposed engravings. Some of the most prominent subjects depict 4-toed human footprint and that of a child-parent grouping. 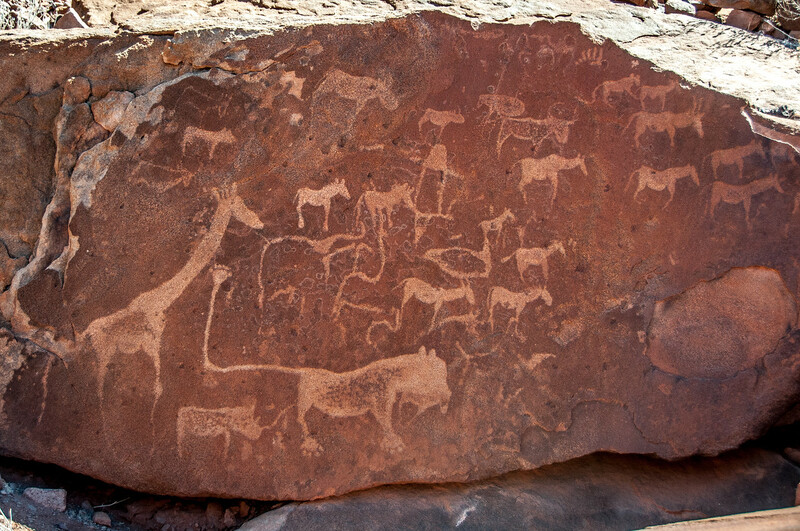 The Seven Slabs Outlier: This rock art carving features 2 giraffes in excellent condition with rough work and jackal. 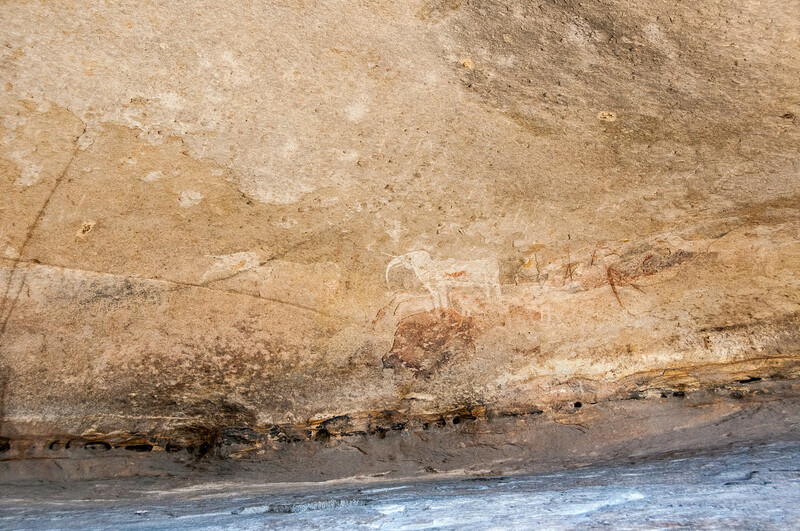 Hare Rock Block: This site consists of 40 paintings and 30 paintings. There are also about 18 depictions of human subjects. Twyfelfontein Main Site Complex: This component of the UNESCO site Twyfelfontein or /Ui-//aes features geometric imagery. This is the site of the red pigment rock paintings. The Boulder Field: This component of Twyfelfontein or /Ui-//aes is home to about 120 rock engravings. The Large Living Area: This section of the UNESCO site consists of 50 rock engravings, 43 rock paintings, and geometric images. The Southern Living Area: This site consists of 250 rock engravings and more than 40 geometric images. 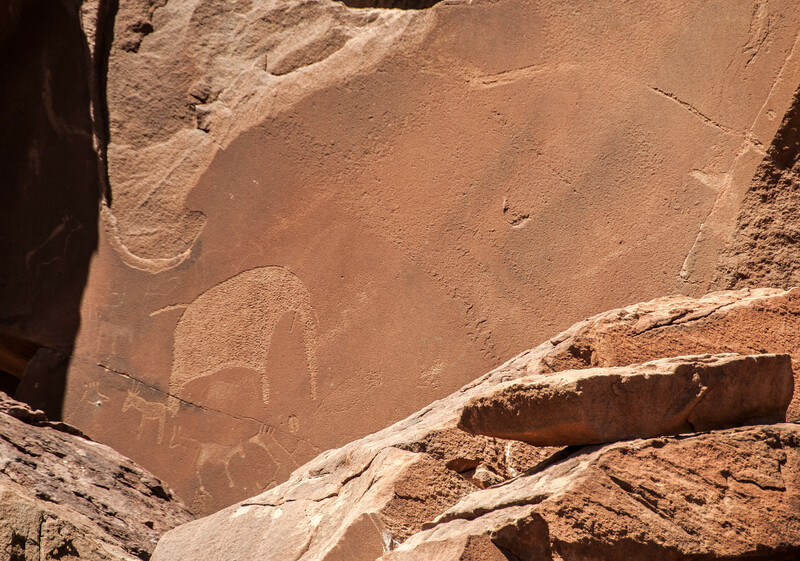 The Right Valley Side: This site is composed of 75 rock engravings built on 15 rock slabs. The most popular craving on the Lion’s Slab. The Left Valley Side: When you visit this site, there are 150 rock engravings on 30 slabs. There are geometric imagery that are found on the site. The Western Hill Slope: This site consists of several pecked animal engravings known as Carsten’s Slab. Bottom of the Western Hill: This site is made up of 10 rock blocks with 120 engravings. At the Large Paint Block: This is composed of 20 engravings and 25 paintings that are placed on an overhang structure. This is considered as the best-preserved painting in the valley. At the Large Paint Block Outlier: This part of the UNESCO site Twyfelfontein or /Ui-//aes consists of an engraved cluster of cupules and spoor. View my complete list of UNESCO World Heritage Sites in Namibia. 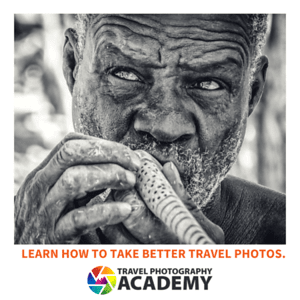 2014 Travel Photographer of the Year! every time a see an article about Namibia I wonder why I did not stayed at the queue to obtain the Namibian Visa..I could have see it , too..